I wasn’t too sure what to expect at first glance of this album, the artwork and the name seemed to me a bit… vague. As the saying goes “don’t judge a book by its cover”; while I am in complete agreeance with that, I am by no means a stranger somewhat accurate estimation. But as I have outlined in previous reviews, bands that don’t blatantly display stylistic plumage get an extra mark for not visually and metaphorically overcompensating. 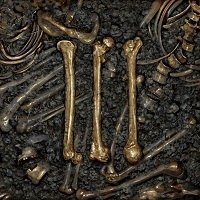 BONE MAN circumvent the obvious and accumulate their talent in the album ‘III’ released through Pink Tank Records. This band the best fundamental elements of Hard Rock, Grunge, Stoner and Alternative; then interweave them into a deliciously packaged final product. The opening track ‘Pollyanna’ confidently flexes aggressive elements of sound, but still harnesses a versatility and delivery that eagerly holds your attention. ‘These Days Are Gone’ is a much more emotive track but is by no means less potent; it really shines a light on what this band is capable of. What starts with just a guitar strumming climbs effortlessly as the other instruments join it; building to a heavy groove, the portly yet captivating vocals make this track climb higher build to a crescendo that really strikes a chord deep in your chest. I could go through a track by track walk through of this album, but I don’t want to rob you of the joy of discovering what it has to offer. Now before you assume this is going to go multi-platinum, I do need to make you aware that despite this is an excellent accumulation of musical pieces; BONE MAN still are not without their short comings. The vocals at times (although fitting perfectly to the sound), can be a bit mono-tone yet you know he is capable of more. And the “fuzzy” overall feel to the tracks could have a little more sharpness in some of the changes. But overall this is an excellent album, these three German lads have really got something here. If the raw angst of the 90’s is a sound that tweaks your spirit, this is for you.